Description：China · Zhouyuan ScenicArea is one of the thirty major provincial cultural industry projectsestablished by Shaanxi Provincial Party Committee and the Provincialgovernment. In the morning of June21, "Shine in the new era, Navigate in the Silk Road——Voice of Shaanxi,Via Which We Communicate With The World" and "Take the state-ownedenterprise responsibility and forge ahead" themed interview group visitedZhouyuan Scenic Area to experience the charm of Chinese ritual civilizationorigins and to explore the new fusion and development model of culturalconstruction + theme park + ancient town and village tourism innovated byShaanxi Tourism Group. 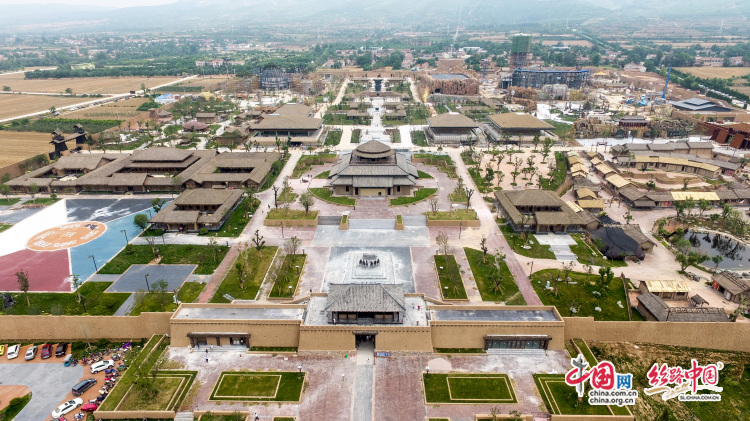 China · Zhouyuan ScenicArea is one of the thirty major provincial cultural industry projectsestablished by Shaanxi Provincial Party Committee and the Provincialgovernment. The project is located in Fengming Town, Qishan County, Baoji City,including Zhoucheng, Zhougong Lake, Zhougong Temple and Fenghuang Mountain,covering 4 square kilometers. Among this, Zhoucheng is a significant componentin "China · Zhouyuan" scenic area of Zhou Dynasty culture, with anarea of 370 mu and a total investment of 680 million Yuan. The constructionbegan in February 2016 and it officially opened on July 18, 2018. The reporter got to knowthat Zhoucheng scenic area of Zhou Dynasty culture conforms to the designphilosophy of "ancient, native, joyful, unique and artful" andconstructs six theme areas, namely, the axis culture exhibition area, Zhouroyal court, Baijiafang, garden for thoughts of a hundred schools, FengshenPark and Birds Park with Zhou Dynasty culture experience as the goal and withthe exhibition and heritage of Zhou Dynasty culture as the core. Deputy general manager ofShaanxi Tourism Group Qishan ZhouDynasty Culture Tourism Industry Development Co., Ltd. toldthe reporter that the Group hopes to build up the scenic area into acomprehensive tourism project combining sightseeing and experience, in order toconstruct the Zhou Dynasty culture experience core tourism destination and fillin the cultural blank in Shaanxi. Meanwhile, it shall take the responsibilityas a state-owned enterprise and practice the poverty alleviation in rural areasso as to promote the economic development in Qishan County and accelerate thedevelopment of cultural tourism industry in Shaanxi.